About four hundred years ago before the Portuguese, Dutch and British started settling in South Africa the Khoisan tribes roamed the countryside. Some of them owned cattle and sheep while others were hunter gatherers. Being hunter gatherers it was necessary for them to explore all forms of food supply. Along the south coast of South Africa they scoured the rocks for shellfish and also caught small fish in rock pools. Big fish were however not on their menu as they had no way of catching them unless they trapped themselves in a shallow rock pool when the tide went out. The Khoisan had spears made from taaibos which were very ineffective especially in water and so to put fish on their table they had to devise a way to catch them. Scouring the rocks every day allowed them to notice that when the tide was very high with dark nights caused by the new moon larger fish often got caught in rock pools when the tide went out. The thought occurred to them that if they could have their own rock pools they might trap more fish in them when the tide was high. With this in mind they set about building their traps. They found a nice flat piece of beach that was not too deep and built a wall of rocks around it. The idea was to allow fish to swim in over the wall of rocks when the tide was high and then be trapped inside the rock wall when the tide went out. Building the kraals was hard work as rocks had to be placed carefully so as to allow water to flow through them and not allow fish once inside to escape. Some of the many viswyvers at Stilbaai. Stilbaai on the Southern Cape coastline is one of the areas where the Khoisan built their viswyvers or traps. When the farmers arrived in the area long after the Khoisan had left they found the foundations of the traps still intact and recognised that they were an ingenious way of catching fish. The farmers set about repairing the viswyvers and used them to catch fish for themselves. As there are not many sites where Khoisan traditions can be seen the authorities have declared the traps a Khoisan National Heritage site. Keeping the traps intact takes a lot of hard work as the sea when it is rough washes many of the rocks off the walls. As there is a benefit for farmers to keep the viswyvers in good shape they do not mind doing so. The traps are a ready source of fish at new moon and farmers use nets to catch the mullet which enter the traps. Unfortunately this has landed them in hot water with the Department of Environmental Affairs, Marine and Coastal Management who say that the gill nets used to catch the mullet kill other endangered species which find themselves in the traps. The farmers disagree as they say its an impossible task to catch the fish without nets as the traps are too big. It appears that the authorities in fact don't want the farmers to catch any fish in the traps but instead want them to install a system of pipes in the walls of the traps to allow the fish to escape. If the authorities choose to enforce the pipe system the farmers will have no incentive to keep the viswyvers intact. It would be a great shame if this were to happen as one of the few authentic Khoisan sites left in South Africa would slowly disintegrate and disappear as the sea took its toll on the rock walls put their so many hundreds of years ago. Lets hope this will not happen and that a compromise can be reached. 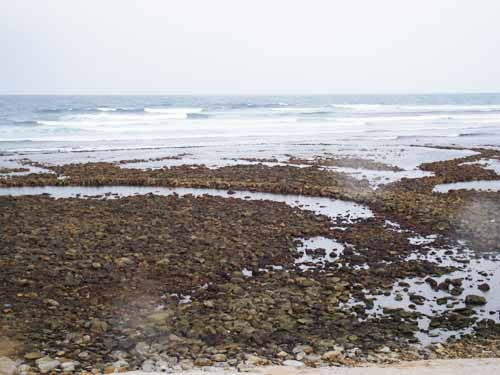 Next time you visit the Stilbaai area take a walk down to the beach at low tide and inspect the many traps that are to be seen along the coastline. You might even find a fish or two in them.